Lot 1129: Colt Single Action Army SN 5773 Positively Proven to Have Been Used by One of Custer's Men During the Infamous Battle of the Little Bighorn, $175,000-275,000. As is usually the case, this is once again an extraordinary event. Over the years, James D. Julia has distinguished themselves as being the leader in high end, rare and expensive items. Their auction company has regularly sold, on average, more high end, rare and valuable guns than any other auction house on the planet Earth. Julia’s had long been known as the go-to place for high end, rare and valuable goods, but in recent years, to serve a wider expanse of consignors, Julia’s created a new segment in their Firearms Auction which is known as the Sporting & Collector Session. This session features moderately priced firearms and accessories, whose average selling price is somewhere in the range of $2,000-8,000. Their Extraordinary Session generally features high end, rare and valuable guns whose normal sale value is in the approximate range of $10,000 and above. Tuesday, April 11th will feature the Extraordinary session of the Julia sale. This sale starts off with an outstanding array of high quality, high condition and engraved Winchesters. First on the block are the Volcanics. Lot #1005 is an extraordinary, nearly new cased New Haven Arms #1 Lever Action pistol, estimated at $30,000-50,000. There are a number of quality Henrys. Lot #1009 is a very fine Hoggson engraved and silver-plated example. This gun is in very fine condition and carries a reasonable $35,000-45,000 estimate. Lot #1017, an extraordinary gold-plated Model 1866 has high relief engraved scenes with much of the original gold still intact. This masterpiece is signed by Conrad Ulrich and carries a presale estimate of $150,000-250,000. Lot #1019 is another incredible C.F. Ulrich engraved Winchester 66. The engraving is unique; the receiver depicts two scenes, both of which are directed to the marketing of the Winchester Repeating Rifle particularly when hunting tigers. On one side of the receiver is a happy, satisfied customer with a Winchester rifle in hand and dead tigers about. On the opposite side of the receiver is a man with an empty single shot musket being pursued by an angry tiger. 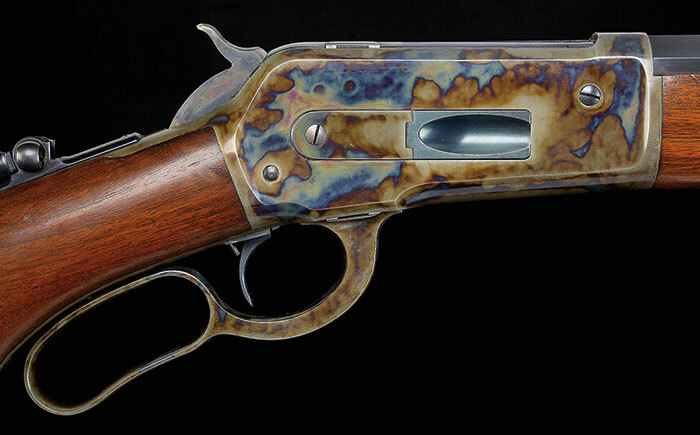 This outstanding Winchester, at one time in the David Crocker Collection and prior to that the Norm Flayderman Collection in the 1970s, carries a presale estimate of $75,000-125,000. The next Winchester comes all the way from Buenos Aires. Lot #1034 is an exceedingly rare John Ulrich M1873 1 of 1,000. Only two of these were ever made with gold and nickel finish. This one was once the property of noted Argentine businessman Don Eduardo Casey and was consigned to us directly by an ancestor. Casey was an avid horseman and a friend of Buffalo Bill Cody. It is believed that Cody inspired him to acquire this prized rifle. 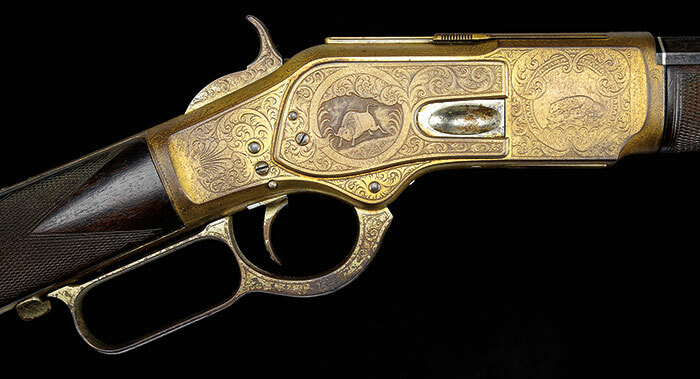 Over the years, the gun has been refreshed but the extraordinary engraved scene features that of a buffalo and a leaping elk. It is estimated at $75,000-125,000. Lot #1061 is a stunning, extremely fine Semi-Deluxe Special Order Model 86 cal. 50 Express. This truly spectacular gun is estimated at $40,000-65,000. For years, Julia’s has been noted for marketing rare and important historical firearms and has probably handled more objects and artifacts from the infamous Battle of Little Bighorn than any other auction house extant. This sale includes what is unquestionably the pièce de résistance in our offerings from the Battle of Little Bighorn. Lot #1129 is a Colt SA Army, SN 5773. 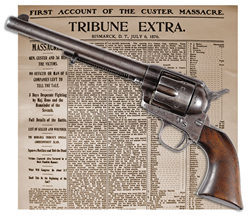 The only U.S. Government documented, complete and original Colt SA Army positively proven to have been used by one of Custer’s men in the infamous Battle of Little Bighorn. As such, it is a great American historical treasure. The gun is documented by Captain Benteen (who survived the battle) as having been used at the Little Bighorn and when he turned it over to the Ordinance Department, he wrote, “rendered unserviceable in action against hostile Indians at the Battle of Little Bighorn, M.T. on the 25th & 26th of June, 1876”. This carries a presale estimate of $175,000-275,000. Lot #1163 is a rare and fine pair of Massachusetts Surcharge Martial Colt Dragoon 2nd Model Revolvers which carry a presale estimate of $30,000-50,000. Lot #1166 is an exquisite factory engraved cased gold and silver Tiffany grip Colt Model 1849 that at one time was in the famous Robert Q. Sutherland Collection. It comes to the auction bearing an estimate of $15,000-25,000. Lot #1173 is an extraordinary and rare highly embellished Edward Bohlin Special Model Saddle with diamond and gold overlay bridle and halter. It is estimated at $30,000-50,000. Included in this sale is a Springfield Model 1875 Type 3 Officer’s Rifle. This example is probably the finest in existence; it is impeccable and about new with an estimate of $40,000-50,000. The Julia Company is also the unquestionable leader in the world today for high end, rare and expensive Confederate and Civil War items. This sale includes a number of Confederate treasures. In an unprecedented offering, this auction will include 3 rare Dance Dragoon Revolvers. One being Lot #1199, a very rare octagonal barrel Dragoon carried by Corp. John Hargrave, Whitefield’s Texas Legion and acquired directly from a family descendent. This fabulous Confederate rarity is estimated at $50,000-70,000. Included with the Civil War and Confederate offerings in this sale is Dr. Zack Catterton’s Collection of Rare Confederate Arms. His extremely fine 1st Model Griswold Revolver, which previously had been in the Fred Slaton Collection, is estimated at $25,000-30,000. Julia’s has had a great history selling rare and collectable Charleston, South Carolina “Slave Hire” Occupational Tags. This sale however includes the finest offering ever. Lot #1228 is a group considered to be exceptional and the finest collection of the rarest varieties ever offered at auction. The group of 12 tags carries a presale estimate of $90,000-125,000. Another great historic treasure is Lot #1231, a rare and extraordinary cased 100 Guinea Lloyd’s Patriotic Fund Presentation Sword for the Hero of the Battle of Trafalgar, Capt. William George Rutherford. Rutherford was originally born in Wilmington, NC. This spectacular sword in its original case is an outstanding treasure and carries a presale estimate of $150,000-250,000. This sale will include a number of rare and handsome Bowie Knives. Included is Lot #1253, the spectacular Massive Early Alfred Hunter Newark, NJ American Bowie Knife. It carries a presale estimate of $15,000-25,000. This sale will also include a fine collection of 16th and 17th century arms from a noted arms collector and scholar. One of the most interesting lots from this collection is Lot #1267, a fine massive and very rare pair of Dutch style Wheelock Hand Mortars, circa 1625. They carry a presale estimate of $35,000-55,000. The Julia Company has also been a dominant force in the investment quality Sporting Arms arena. For many years, they have consistently sold more high end, rare and valuable sporting arms than any other auction house on the planet Earth. This sale includes a number of treasures. 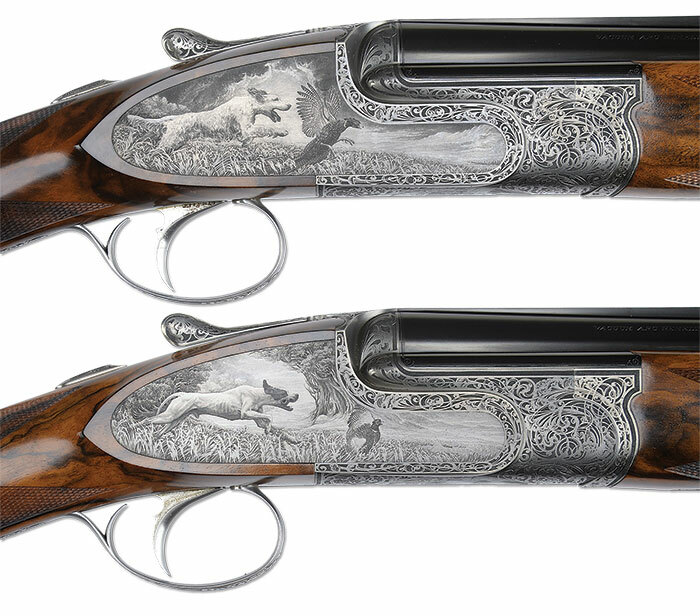 Lot #1296 is a stunning pair of Fabbri 20 ga. O/U Game Guns with incredibly detailed scenes by renowned master engraver, Firmo Fracassi. 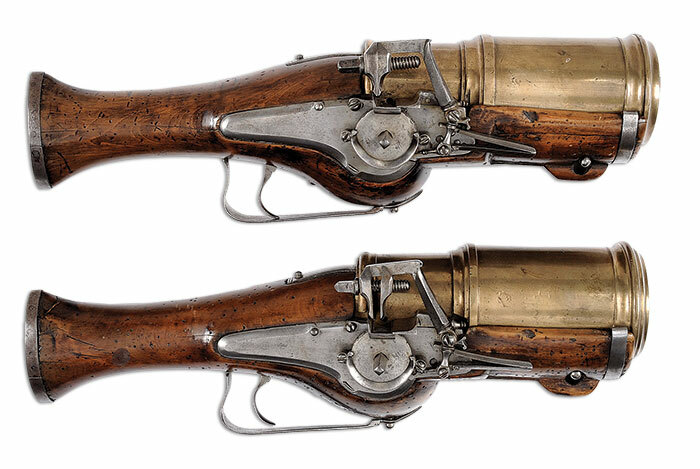 These guns are considered possibly the finest Fabbris in existence and are unquestionably the pièce de résistance and the pair are estimated at $375,000-575,000. Lot #1310 is an exceptionally rare early Perazzi DHO Side-by-Side Sidelock Ejector Single Trigger Heavy Game Gun with full relief scroll and game scenes by Galeazzi. This fine cased gun is estimated at $40,000-60,000. Lot #1337 is a superb Pre-War Boss 20 Bore Sidelock Ejector Game Gun with scarce single selective trigger and case. It is estimated at $35,000-55,000. Lot #1368 is a very fine H&H 500/465 Nitro “India Royal” Sidelock double rifle with case, estimated at $47,500-67,500. A number of fine American Sporting Arms are, as always, offered in this sale. Lot #1414 is an incredible, fresh to market, high original condition 20 bore Parker A1 Special. Having fine scroll engraving and gold inlay, this recent discovery carries a presale estimate of $125,000-200,000. Lot #1430 is a fantastic special order Lefever Shotgun which is about AA quality, in high original condition. It comes to auction with a $35,000-50,000 presale estimate. Lot #1448 is a rare Winchester Custom Grade Model 21 410 Shotgun with 3 gold inlays and solid rib, estimated at $40,000-60,000. One of the finest collections of German Pickelhauben and early military helmets is that of Doug Buhler. Unquestionably one of the best brought to the market in many years. Lot #1500 is a Royal Saxon Guard Rider Officer’s Helmet with silver parade lion estimated at $25,000-35,000. Lot #1502 is a beautiful Wuerttenberg Artillery General Officer’s Helmet Model 1897 white/black/red feather bush. It is estimated at $12,000-15,000. Another fine collection is that of German industrialist, Friedrich-Wilhelm Dauphin. This is the final session of Mr. Dauphin’s Collection of Rare Military Pistols and Lot #1516 is an absolutely superb Early Loewe Borchardt Model 1893, SN 13, with experimental features. In absolutely stunning condition, it is estimated at $50,000-100,000. Lot #1528, also from the Dauphin Collection, is a unique Mauser Pre-Step Barrel Carbine SN 9. 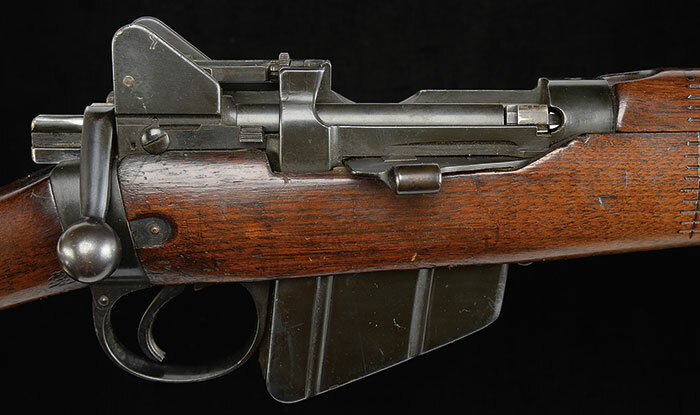 It is estimated at $50,000-75,000 and is part of a very fine offering of C96 Mausers. The military collecting fraternity recently lost one of its great scholars, that being Warren Buxton. Warren was a wonderful man, passionate collector, great scholar and amassed what is most certainly the finest, most comprehensive remaining collections of Walther arms remaining in private hands today. He was also the author of what is considered to be the 3 Bibles on Walther pistols. This sale includes a number of great rarities from Warren’s collection. Lot #1565 is his extraordinary Walther Armee (AP) Pistol with long barrel, alloy frame, matching stock, and two matching magazines. It comes to auction with a $60,000-90,000 presale estimate. Warren's collection of P38s includes almost every model and variation that one could imagine. Lot #1569 is a rare and important early Walther P38 Prototype pistol SN 2A, in excellent condition, and is estimated at $25,000-35,000. Another great collection of military pistols to be offered in this sale is that of Frank H. Wheaton, III. 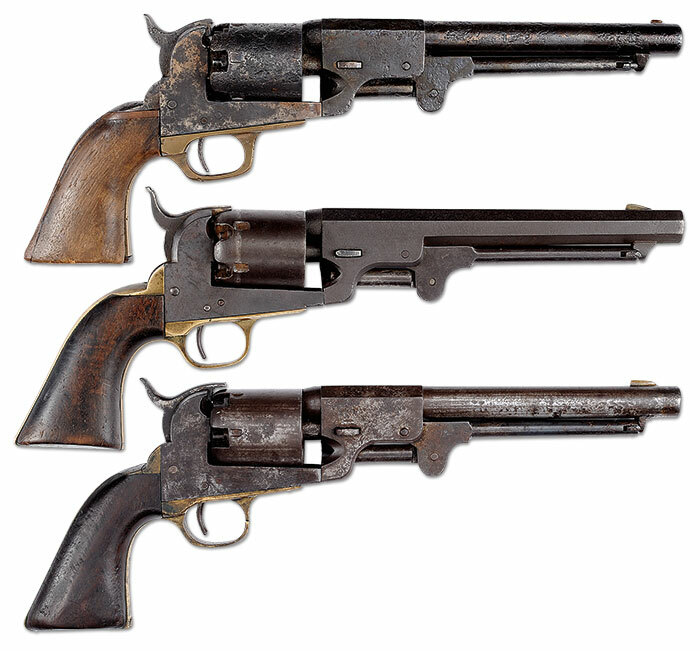 Frank’s collection consists of a number of great rarities and U.S. Trial pistols. Most notable is Lot #1620, one of a kind Knoble 45 cal. US Military Test Pistol estimated at $30,000-60,000. Lot #1630 from the Wheaton Collection is a fantastic unissued Singer Model 1911 A1 Presentation Pistol in superb condition and carries a presale estimate of $50,000-80,000. Lot #1641 is a rare and spectacular M1 Garand Gas Trap Rifle, No. 338. It is probably the best one in existence and in exceptionally fine condition. It is estimated at $25,000-35,000. The world renowned Collection of British Rifle Collector, Robert W. Faris includes Lot #1645, his incredibly rare 1924 British R.S.A.F. Enfield .303 SMLE No.1, MK VI Prototype Rifle, estimated at $15,000-25,000. Lot #1665 is a fantastic and extremely rare Polish WZ 38M Pre-WWII Semi-Auto Rifle. Only a few of these are known to exist and this fine example is estimated at $40,000-80,000. Since 2008, Julia’s has led the way with Class 3 weapons. To date, Julia’s has sold more units and more dollar value of Class 3 than all their North American auction competitors combined. This sale includes a number of fine Class 3 weapons and this sale includes not one but two extremely rare German FG42 Machine Guns. The fantastic First Model is Lot #1699 and is estimated at $175,000-250,000. Lot #1700, the extremely scarce Second Model comes to auction with a reasonable $150,000-200,000 estimate. Wednesday, April 12th, includes a vast array of Sporting & Collector items. This session will start off with a large number of quality Winchester rifles. A scarce, early Model 66 Saddle Ring Carbine is estimated at $10,000-17,000. Colts, particularly SAs have always been highly sought after and this session includes a number of interesting examples. 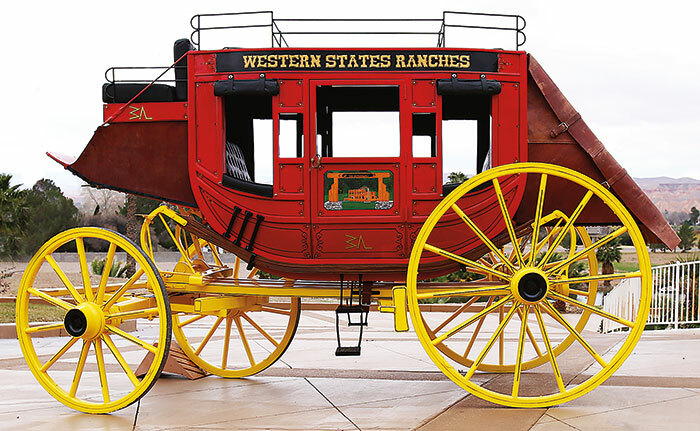 Lot #2143, an engraved SAA was purportedly owned by Jack Case of the 101 Ranch Wild West Show. This is estimated at $7,500-10,000. Sporting Arms is another strong segment of the Julia auction and over the years, Julia’s has not only set the world record for the most expensive sporting arm ever sold but they regularly sell more high end, rare and valuable sporting arms than any other firearms auction house in the world. The Sporting & Collector session will include a number of moderately priced, yet highly collectable sporting arms, including Lot #2263, an antique Purdey lightweight Game Gun with extra barrels and case, which is estimated at a modest $4,000-7,000. A number of highly desirable Colt Diamond Backs and Pythons will be offered in this sale, including Lot #2487, a rare Colt Python “10 Pointer” with scope estimated at $4,000-7,000. Thursday, April 13th, begins with Class 3 weapons. Lot #3004 is a Finnish Lahti 20 mm Semi-Automatic anti-tank rifle estimated at $6,000-10,000. 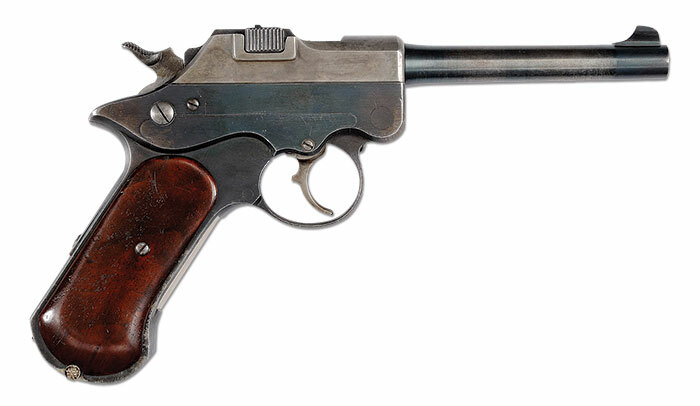 From the Frank H. Wheaton, III Collection of Semi-Automatic pistols is Lot #3011 is a Model 1902 Military Pistol with Round Spur Hammer estimated at $5,000-8,000. This sale will include a vast number of P38s, many or most of which are under $1,500. However, Lot #3067 from the Buxton Collection is a very rare Walther Model HP Dural frame lightweight with holster and is estimated at $7,500-12,000. Next is the final session of the renowned Allen Hallock Collection of Rare and Important Schuetzen rifles. One of the most exciting items in Allen’s collection is Lot #3146, the Ehret-Schuster Trophy. A huge and absolutely extraordinary and elaborate gold, silver and enameled tankard-shaped trophy in a special carved oak display case. This piece, considered the ultimate American shooting trophy, was presented at the first National Bundesfest which was held at Schuetzen Park in Glendale, Long Island in June of 1895. This extraordinary trophy, unlike most items in the Sporting & Collector session, is estimated at $40,000-60,000. Also included in the Thursday sale is Lot #3231, an unusual Nickel-Plated Confederate LeMat Grade Shot Revolver estimated at $12,000-15,000. Bowie knives include Lot #3249, a rare Virginia made Confederate etched “Sunny South” Bowie knife which is estimated at $4,500-6,500. From the Doug Buhler Collection of Rare Pickelhauben will be Lot #3347, the Baden Field Artillery Officer’s Helmet Model 1897 which carries a presale estimate of $2,000-2,500. Early Percussion and Flint arms will also be included. Lot #3514 is a very rare Baker Volunteer Rifle by Henry Nock incorporating his patented breech and pinless lock with Baker bayonet and scabbard which carries a presale estimate of $3,500-5,500. Lot #3522 is a pair of Westley Richards Percussion Holsters for Officer’s Pistols with pamphlet pertaining to dueling. This interesting lot is estimated at $3,500-5,500. Lot #3573 is a fine 1762 dated Powder horn of Jonathan Moony. It is estimated at $3,000-5,000. Lot #3578 is one of a handful of Kentucky rifles identified as a silver and brass mounted “P. York 1837”, signed, full stock Kentucky rifle which is estimated at $2,000-3,000. Julia’s next Firearms Auction is scheduled for Fall of 2017 and will again include a fabulous collection of spectacular arms. James D. Julia, Inc. is one of the top 10 antique auction houses in North America as measured by annual sales. It is headquartered in Fairfield, Maine. The company also has an office just outside Boston, Massachusetts in Woburn and has been in business for nearly 50 years. The company conducts high end, antique collectables and fine art auctions throughout the year. Julia’s has routinely established new world auction records through its sales events. The company consists of 3 key divisions. The rare Firearms Division in which they are the leader today for high end, rare and valuable guns. Their next Fine Art, Asian & Antiques Division auction will take place in August 2017. Also, the Rare Lamp, Glass & Fine Jewelry Division, again a leader in this genre, will hold their next auction on June 2017. Each division is regarded for its excellence and is staffed with world class specialists to ensure fair and professional authentication, identification and evaluation services. For more information on James D. Julia, Inc. please visit http://www.jamesdjulia.com. Lot 1019: Incredible C.F. Ulrich Engraved Winchester Model 1866 with Rare and Humorous Engraved Promotional Scene, $75,000-125,000. Lot 1034: Exceedingly Rare, John Ulrich Engraved Gold and Nickel Finish Winchester Model 1873 1 of 1000 of Argentine Businessman Don Eduardo Casey, $75,000-125,000. Lot 1061: Extremely Rare Semi-Deluxe Special Order Winchester Model 1886 “Big 50 Exp”, $40,000-65,000 Lot 1172: Scarce Werner Wagon Works Replica 1846 Concord Nine Passenger Stagecoach, $30,000-40,000. 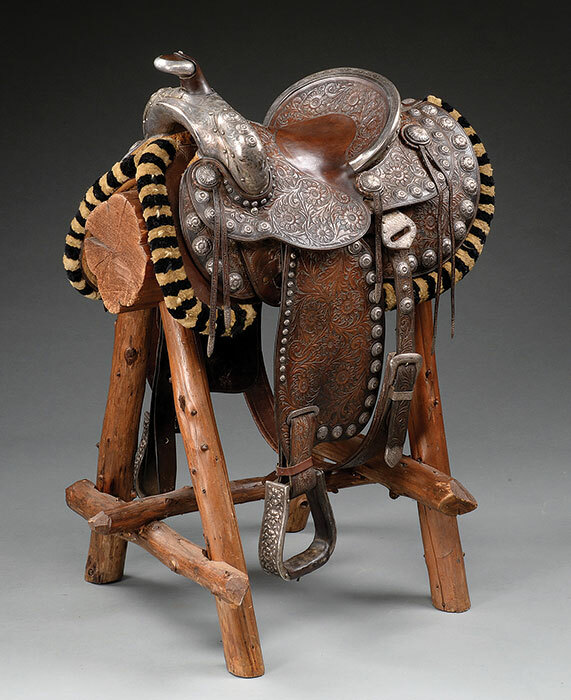 Lot 1173: Extraordinary and Rare Highly Embellished Edward Bohlin "Special Model Saddle with Diamond and Gold Overlay Bridle and Halter", $30,000-50,000. Trifecta of Dance Confederate Revolvers. 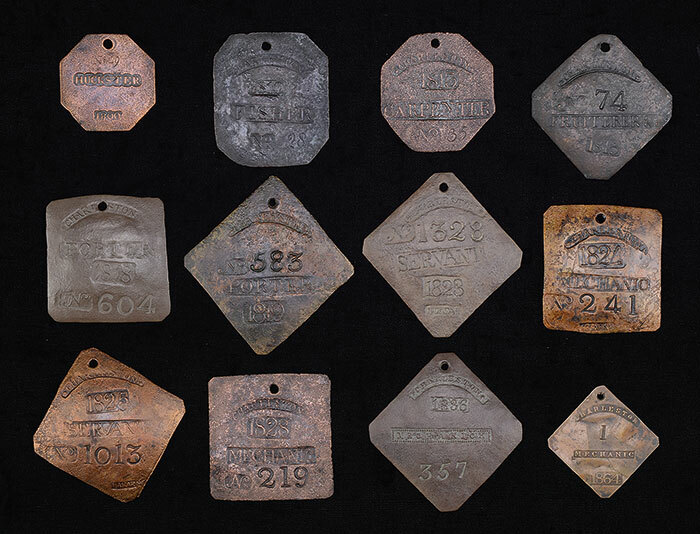 Lot 1228: Exceptional and Finest Collection of Rarest Varieties of Charleston, South Carolina, "Slave Hire" Occupational Tags 1800-1864, $90,000-125,000. 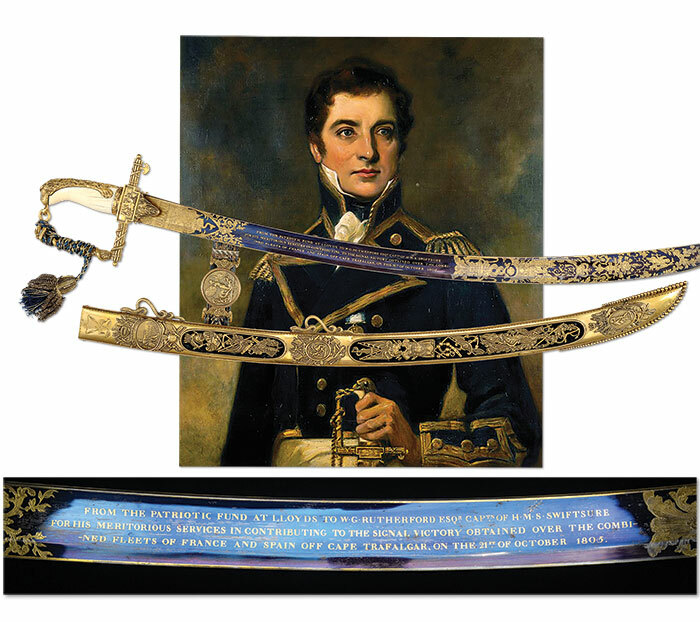 Lot 1231: Rare and Extraordinary Cased 100 Guinea Lloyd's Patriotic Fund Presentation Sword for Hero Of Battle of Trafalgar, $150,000-250,000. Lot 1247: Rare, Spectacular, Massive and Most Recently Discovered Henry Schively Bowie Knife, 50,000-100,000. Lot 1267: Fine, Massive and Very Rare Pair of Dutch-Style Wheel Lock Hand Mortars, Circa 1625, $35,000-55,000. Lot 1296: Stunning Pair Of Ivo Fabbri 20 Ga Over-Under Game Shotguns with Incredibly Detailed Game Scenes by Renown Master Engraver, Firmo Fracassi, $375,000-575,000. Lot 1368: Very Fine Cased Holland & Holland .500/465 Nitro "India Royal" Sidelock Double Rifle, $47,500-67,500. Lot 1414: Incredible, Fresh To Market, High Original Condition, 20 Bore Parker "A1 Special" Having Fine Scroll Engraving and Gold Inlay, $125,000-200,000. 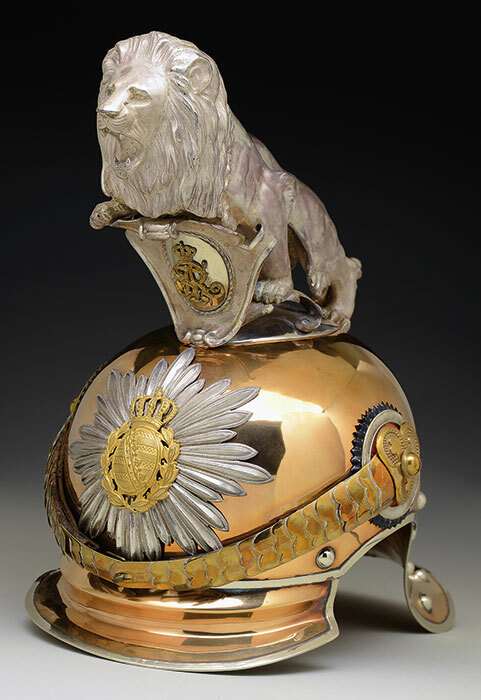 Lot 1500: Royal Saxon Guard Rider Officer's Helmet with Silver Parade Lion, $25,000-35,000. Lot 1565: Extraordinary Walther Armee Pistole with Long Barrel, Alloy Frame, Matching Stock and Two Matching Magazines, $60,000-90,000. Lot 1620: One-of-a-Kind Knoble .45ACP US Military Test Pistol, $30,000-60,000. Lot 1645: Incredibly Rare 1924 British R.S.A.F. Enfield .303 SMLE No. 1 Mk VI Prototype Rifle, $15,000-25,000. Lot 1665: Fantastic and Extremely Rare Polish WZ. 38 M (Maroszek) Pre-WWII Semi-Auto Rifle, $40,000-80,000. Lot 1700: Extremely Scarce Krieghoff FG-42 2nd Model Machine Gun, $150,000-200,000.